Rain gutters handle the most critical and major task of routing the runoff water from the roof of your building to a proper drainage. 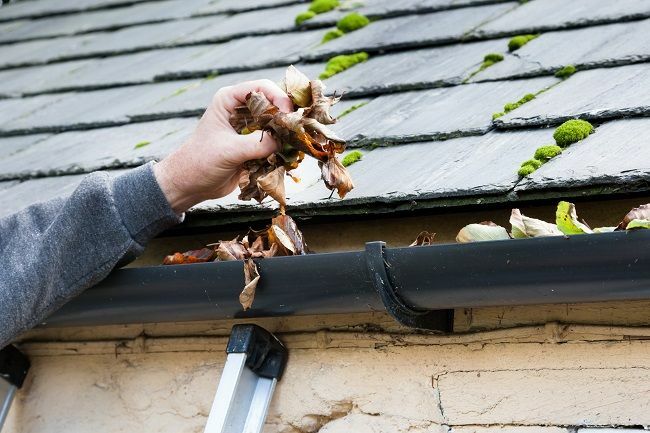 By performing this task, rain gutters keep your home high and dry. They form the first line of defense against wet basement, protecting your infrastructure and surroundings from water damage. If the water collects along the foundation, it will eventually enter your house. So, it is important to keep the rain gutters in good condition. Now we will see how we do cleaning and gutter repairs like patching a hole, sealing leaky corner, fixing a saggy gutter and preventing gutter overflow. By fixing all these problems as noticed, we can make rain gutters work more efficiently and effectively for a longer duration. Clean the gutter near a downspout. Remove all the debris such as leaves, stems, etc., using cloth and collect them in your bucket. Now, start cleaning the gutter with water using hose and leave the water to drain. If the water doesn’t drain, check the downspout for any clog. Install a hose, turn on the water and feed the hose up from the bottom of the downspout. If this method doesn’t clear the clog, then you need to use snake tool to clear the clog. Reattach the downspout and flush your rain gutter again. Finally, clean the downspout strainers. Rain gutters develop holes in a number of ways. Holes might be due to rust, puncturing or through drilling in an attempt to drain water. You need to patch holes as soon as you notice. A simple way to patch a rain gutter hole is to use a roofing cement and a metal-repair patch. Joints between the different lengths of a gutter may fail over a period of time. Even if you install seamless gutters, they are not fully immune to dribbles. Standing waters are the main reason for leaky joints, so adjust or add gutter hangers as needed to ensure free flow of water through your rain gutter. Gutter overflow may cause serious problems to walls and foundation. So make sure the rain gutter is not overflowing when you carry out gutter repairs. If you notice gutter overflow during heavy rain, then your gutter is not large enough to hold the water runoff volume. In this case, just replace it with a larger one. But in most cases, gutter overflows when debris is blocking the water flow. When this is the case, just clean the rain gutters as mentioned above. Heavy water flow makes the gutter to sag, especially if they are made of flexible materials such as aluminum, galvanized steel, or vinyl. You can fix this problem either by adjusting or replacing the hangers. You may need to use hammers to drive the long spike, if spike and ferrule hangers hold the rain gutters. All in all, follow these simple steps for cleaning your home’s rain gutter and making simple gutter repairs. Gutters are sometimes the most forgotten part in hour homes. Thanks for the tips! I was wondering, how often do you suggest we clean our gutters? I should be better at cleaning my gutters. I’m sure it is crucial in keeping my gutters working like they should, like you said. I am sure I have a lot of leaves in my gutters right now from the fall and winter. I want to incorporate cleaning my gutters in my spring cleaning. Thanks for pointing out that holes come from things like rust. My gutters are leaking whenever it rains, and it defeats the purpose of them. I’ll have to find some sort of gutter service to fix it. I had no idea that gutters could form holes due to rust degradation. My gutters are rather old, so I’ve been wondering if I should repair or replace them. Do you have any tips for determining that?